We all want to simplify our lives -- starting tomorrow. We would start today, but we've got too many things on our plate to begin the process, right? I hear ya. Here are five things you can do today that will make a difference immediately, regardless of how complicated your schedule is. Make a list of the three or four essential things in your life. What would happen if you eliminated everything else today? Imagine the "worst case scenario" if you didn't make that batch of brownies for the PTO, or if the laundry didn't get done, or if you didn't chaperone the field trip. Chances are, life would go on. Do the essentials first, and THEN fill in with the extras. Do one thing at a time. Multi-tasking has become a way of modern life, but it actually makes you less focused, less engaged, and less efficient. It robs each task of your full attention, energy and creativity. Doing one thing at a time means that you are present and able to make the most of each moment. When you stop juggling "the next thing," you'll find the beauty and joy that's in front of you right now. If you start having heart palpitations every time your phone or device is not in your hand or on your person, it's a good sign that you're addicted to it. Limit your email checks to a few specific times each day, and consider that Facebook can function just fine without your current status. Change the notification settings on your devices so you are not distracted by alerts popping up. Here's what I learned when I took a Social Media break last year. I still struggle with this, and have to constantly recommit to unplugging. Social media has its place, but let's be honest: it crowds out real living. In a culture that celebrates the "new and improved" versions of everything, we can easily get sucked into thinking we need more and better stuff than we already have. Do you have food to eat? Clothes to wear? A car to drive? You have more than billions of people on this planet. You have enough. Practice gratitude and model it to your children. Less stuff = less to take care of, less to worry about, less to spend money on. Truth: You will always be asked to do more than you can or should. Setting healthy boundaries around the things you value (your family, your time, your faith) means that you'll have to say "no" to good things in order to preserve the best things in your life. Make a habit of asking for time to think about a new commitment before adding it to your already-full life. Discuss it with your spouse and family, or a friend, before you commit to anything. Others can help you see your own limits when you can't. Learn that a healthy "no" brings a "yes" to peace and simplicty. The past couple of years, I've committed to breathing. To letting go of the unnecessary. I've found that it takes a constant effort to keep chaos at bay and simplicity at the forefront. These five things are helping me make better decisions and enjoy each day to the fullest....and I am breathing. Are you? How about you? What is YOUR best strategy for simplifying? What will you do today that will make life better? I hope you'll share! Back-To-College Prep Time! Are You Ready, Mom? My son, Grayson, is starting his junior year in college. Each year, it's gotten a little easier to say good-bye, but I do admit to a tiny hole being torn in my heart when I watch his car drive away. OK, maybe a big hole. Being ripped right outa there. Time to get back to college after a summer of adventures. I've already started thinking about ways I can help him get settled and ready for a heavy load of engineering classes this fall. Living off campus gives him a lot of flexibility, but it also poses a few challenges, particularly in time planning. There isn't a whole lot I can do for him from far away during the semester, so I'm doing some things that will last throughout the year to make life a little easier for him. 1. Stock up on snacks and easy meals. I like to make seasoned hamburger patties and freeze them individually, and I also freeze Baked Ziti in small loaf pans for him. He's usually resourcesful when it comes to food, but sometimes it's nice to be able to pull something made by mom from the freezer. Also granola bars and instant coffee packets are always handy. 2. Purchase basic school supplies (paper, ink, notebooks, thumb drives, etc) at office supply stores ahead of time. That way he doesn't have to pay higher prices at campus stores, and he can get exactly what he needs without waiting in long lines. 3. Buy enough underwear and socks to last between laundry trips. Two weeks worth? Three weeks' worth? I don't know. I haven't actually had the nerve to ask. Just get lots, and you can't go wrong. 4. Stock up on cleaning items. Whether or not he and his roommates choose to use them, and at what level of clean they are comfortable with - those are questions only they can answer. But they DO have a toilet brush and cleanser, should they decide to use it. I can rest easy. 5. Don't forget personal items. My frugal boy hates spending money on personal stuff (shampoo, soap, deodorant, razors) when you can easily spend that money on way funner stuff, like a cup of coffee with friends. But I don't want that to keep him from taking care of business. Recently, I found out about Gillette's subscription service. It is an easy way to make sure Gray is never out of razors, and only for about $1.00 per week. As a junior, he is conscious of looking a little bit more pulled together than those scruffy underclassmen, especially as he takes on projects and has more interactions with professors. But I worry that he might forgo a shave for lack of razors, so this gives me the perfect way to make sure he's ready for that job interview or internship opportunity. Or, for that cute girl in the library. It's the least I can do. It's how I roll. I'd like him to get a good job AND find a nice girl. So I had him try these Fusion ProGlide razors, the ones with Flexball Technology. I received some samples in the mail and figured it would be worth a shot. Gillette calls it "Shaving Rebuilt" because its new handle lets the cartridges move in three directions for a close shave. With the subscription options, I can easily have them delivered right to his door. Nice. Easy. And that other word: Affordable. I bought a subscription for my husband while researching this product. He is forever running out of razors, making special trips to the store, and coming home disappointed with whatever they had on the shelves. I told Tom I was looking into these, so he stole one of Grayson's razors and tried it. His words: "Best shave of my life." I'm popular with the men of this household right now. Only a couple more years and these college good-byes will be over. I'm trying to savor the planning and prepping by slowing it down, spreading it out, and thinking it through. It doesn't stop the little hole in my heart, but it does make it a tiny bit easier. What are some tips you can share for moms to help their students go back to school? You can learn more about the Fusion ProGlide Razors with Flexball Technology subscriptions here. I only post about products I have used and believe you might value. Disclaimer: Compensation was provided by Gillette via MomTrends. The opinions expressed herein are those of the author and are not indicative of the opinions of Gillette or MomTrends. Have you ever thought about taking a break from social media? I stepped back from blogging several weeks ago, and seriously cut back on the other forms of social media I use most often: Twitter, Facebook and Instagram. I didn't really mean to do it. It just sort of happened as I was finishing up my manuscript and needed extra mind-space to think. I needed a buffer between me and the emails and comments and updates that take up time and residence in my life on a regular basis. I'm a uni-tasker by nature. And I'm not embarrassed about that anymore. 1. Taking a social media break feels good....eventually. It took several weeks for the emails to slow down. I get tons of emails each day...mostly from comments on my blog that are automatically sent to my inbox. At first, it felt really strange. I felt a little lost without the daily affirmation from my blog readers. No blog post = no comments = no emails. And it made me realize how much I'd come to depend on those emails, how often I checked my inbox, and how much time it takes to respond. I began to enjoy the freedom. 2. Life goes on without my updates. Truth: nobody really cares what restaurant I'm eating in, what I'm having for dinner, or what I happen to be thinking about at this very moment. They might care about the robin's egg blue toenail polish I'm wearing, but do I really need to post a photo of my toes? 3. When you don't have to let people know what you're doing, you can actually enjoy things more...for yourself. Back to the toenail polish. If I'm not planning to post a photo of my toes, would I choose blue? Or would I just enjoy pink, because that's my favorite, (but not an Instagram-worthy/comment-worthy color?) Social media makes me unnaturally conscious of what others think. I don't like that about myself. But I do I like pink nail polish. So there's that. 4. Life is better without distractions. Oh, the things we miss. Oh, the beauty all around us that's lost as we stare into our phones. I missed a wonderful conversation, in my own living room, with our son - because I sat on the couch and worked on editing a photo for Instagram and forgot to join in. The photo was lovely, but the conversation was even lovelier...and I missed it. I'm trying to practice setting my phone down - away from me - so I can fully embrace the moment I'm in. 5. To live intentionally, you have to let some things go. Let's be honest. We are all juggling a lot of balls. The responsibilities of life can be overwhelming, and sometimes it's impossible to see where we can make any adjustments at all. There have been seasons of my life in which I've yelled, "TELL ME WHAT I CAN DROP! BECAUSE I CAN'T SEE A SINGLE THING I CAN LET GO OF!" But perhaps asking God for wisdom, for clarity, and for help would be a good thing. Sometimes we do need Divine Intervention in order to see how we can make some changes. Living intentionally means making some tough choices so that we can grab ahold of what's really important. 6. Creativity takes time and space. Creating stuff takes work. It takes commitment. It takes nurturing. And I'm not just talking about art and writing. Parenting requires creativity. So do most work-for-pay jobs. LIFE requires creative thinking and problem-solving. When our lives are so crammed with information and factoids and busyness and activities, we simply cannot function as creatively as we should. We end up doing bare minimums out of necessity, because we just. can't. do. another. thing. Time and space are rarely handed out on silver platters. They must be fought for. They must be valued. which looks a whole lot like wasting time. We must stare at clouds and quilting patterns and fireflies and pretty pictures. We must listen to music. We must leave margin for serendipity. We must value time and space as soul-rechargers, rather than seeing them as pockets to fill with more activities and media. I'm still working out my relationship with social media. It is here to stay, and it will always be part of the work I've chosen. But taking a break, stepping back, letting things settle a bit.....well, it can only be a good thing. How about you? Have you ever taken a break from social media? What did you discover when you did? Is this something you would be willing to try? 1. Decide what's important. Make a list of the three or four essential things in your life. What would happen if you eliminated everything else today? Imagine the "worst case scenario" if you didn't make that batch of brownies for the PTO, or if the laundry didn't get done, or if you didn't chaperone the field trip. Chances are, life would go on. Do the essentials first, and THEN fill in with the extras. 2. Be a Uni-tasker. Do one thing at a time. Multi-tasking has become a way of modern life, but it actually makes you less focused, less engaged, and less efficient. It robs each task of your full attention, energy and creativity. Doing one thing at a time means that you are present and able to make the most of each moment. When you stop juggling "the next thing," you'll find the beauty and joy that's in front of you right now. 3. Unplug. If you start having heart palpitations every time your phone or device is not in your hand or on your person, it's a good sign that you're addicted to it. Limit your email checks to a few specific times each day, and consider that the Twitterverse can function just fine without your current status. The constant bombardment of updates, news and information does not add quality to your life...it overloads you with mind-clutter and consumes valuable time. But you already knew this. 4. Embrace "Enough." In a culture that celebrates the "new and improved" versions of everything, we can easily get sucked into thinking we need more and better stuff than we already have. Do you have food to eat? Clothes to wear? A car to drive? You have more than billions of people on this planet. You have enough. Practice gratitude and model it to your children. Less stuff = less to take care of, less to worry about, less to spend money on. Less stuff = freedom. 5. Say "no." Truth: You will always be asked to do more than you can or should. Setting healthy boundaries around the things you value (your family, your time, your faith) means that you'll have to say "no" to good things in order to preserve the best things in your life. Make a habit of asking for time to think about a new commitment before adding it to your already-full life. Discuss it with your spouse and family, or a friend, before you commit to anything. Others can help you see your own limits when you can't. Learn that a healthy "no" brings a "yes" to peace and simplicty. This year, I've committed to breathing. To simplifying. To letting go of the unnecessary. I've found that it takes a constant effort to keep chaos at bay and simplicity at the forefront. These five things are helping me make better decisions and enjoy each day to the fullest....and I am breathing. Are you? Yesterday, I had a chance to interview Sabrina Soto, of HGTV's "Get It Sold." Sabrina has some great tips on how to stage your home for selling, some easy spruce-up ideas, and a chance to win a home "scentervention" makeover from Gain. Well, she had me with the word "scent," because, as is documented extensively on this blog, I have "old house" issues. When I read THIS on her press release, I was both disheartened and hopeful. Disheartened that the "eau de ancient hotel" scent which has eluded my best efforts to kill it would "reflect who I am." But I'm hopeful that there might be some new products that will help me become a "scent-savvy star." And enter to win the "scentervention" home makeover by visiting www.ilovegain.com or their official facebook page. But you'll have to fight me first 'cause I wanna win it. PS. My husband was teasing me about my over-use of the word "awesome" in the interview. It's true, I over-used it. But I submit to you that Gain's own website uses it twice on the same page. Ha. My husband was frustrated with the amount of clutter and debris piled into our closets and drawers. "Every single thing you open has a bunch of junk in it," he said, disgustedly. "And what the heck is something like THIS doing here?" he scooped it up and held it in his palm for me to see. "Why do we have ROCKS in our drawers?" Tom looked skeptical. Just to prove my point, I told him to go show Meghan and ask her about it. I could hear Meghan tell her dad about how she and Lauren used to love finding rocks. Fat ones, sparkley ones, black ones, skinny ones. But none were are as special as this guy. He was flat, yet rounded and smooth. He fit just perfectly in their little hands. And with his stripes, he practically named himself! Lauren introduced him to me and then set him on the wooden kids' table that sat in our kitchen. Stretch kicked around as a paper weight for quite some time. For awhile he lived on the window sill above my kitchen sink, and then finally one day he became a member of the junk drawer club. He made the move with us from city to country, having survived numerous rounds of cuts as we purged our belongings down to the essentials and important mementos. It's really no surprise that he found himself in the company of the medals and awards. I look at those tarnished trophies that celebrate our children's accomplishments, and I have to squint my eyes to recall the ceremonies in which they received them. I can't even remember what most of the certificates were for. But Stretch, I can remember Stretch. Holding him in my hand brings a flood of memories. He was from a time of pure innocence, an era of my kids' childhood laughter and play. There were birthday parties and Santa Claus, recess and make-believe. The dress-up clothes were never put away neatly, the kids' table was awash with craft supplies, and there was always some kind of drama with playmates going on. It was such a messy, noisy and crazy time of life. Who would have thought it would be over so soon? But I look back now, and of all the things we've saved from those years, Stretch holds a certain place of reverence in my mind. His simplicity, his quiet strength, his ability to keep secrets and his knowledge of all that's happened in this family make me treasure him all the more. "See?" she said. "Isn't he just perfect?" We started a new mural in this house today. It is a quaint 10,000 square foot chateau on Tour 18, a very prestigious gated golf course community. The home boasts garages for 5 cars, at least 5 fireplaces, a kitchen the size of a bowling alley, and guest quarters that could house a couple of 3rd world families. We marveled at the neighborhood as we drove through. Home after home of incredible taste and distinction. Wow, they are beautiful. Many already had crews of men putting up elaborate Christmas displays. I'll bet it's a sight to see during the holidays, all lit up. I enjoy seeing the beauty and artistry that money can buy. All the world's finest art, sculpture and architecture that we appreciate today has been funded by wealthy patrons of the arts through the centuries. And I love to see the textures, the finishes, the rarest materials, and the imagination that goes into creating these dream homes. But I felt a little lost, going through the maze of rooms inside this home today. The children's rooms seemed awfully far away from the master suite. And the cavernous media room was in a wing that was a flight of stairs and several hallways from the kitchen. A person's food would be cold by the time you took your plate up to eat in front of a movie. You'd never be able to hear each other yelling from one room to another. And you'd have a hard time even finding each other if everyone was in their own room. I guess that's why I like our humble house. You're not going to get lost going from the kitchen to the "Back Room," as we call it. The hallway to the back has a ceiling so low you can almost palm it. I think whoever built this house forgot to leave room for the pipes and just had to make the ceiling lower in that spot in order to run them. Oops. Tom is going to paint our Barn House this week. After searching high and low for a color with more "WOW" factor, we settled on one that is almost exactly like what we already have. I guess we like the humble yellow, too. There aren't any manicured walkways leading to our little spot back here. We're barely able to manage those doggone weeds that grow so fast. But when I turn our yard light on at night, there is magic in the air. The fall leaves that skipped across those fancy streets today are the same kind that fall in our gravel driveway. And the air smells just as good, if not better. The evening breeze tells me that cooler nights are coming, and that our little place will be just the kind of shelter we need most in this world. Our home is our refuge. It's not a statement on who we are or what we've accomplished. It is more than that. It's the place where we circle the wagons and relish the safety and love that's found in the people who live here. It's not fancy. But it's real, and it keeps the treasure of our family within its walls and under its sloping roof. It will be a pleasure to work in such a magnificent house this week. I will enjoy experiencing the fine workmanship that has gone into every detail. But I will love coming home to this place, with its worn linoleum floors and doors that stick shut. It's where abundance is measured in laughter, and riches in the depth of shared memories and tenderness. There is no better place to live than where you are loved best. My Weekly Schedule has changed more times than Britney Spears has changed her hair. Sometimes I've let it go completely, and then other times it has kept me afloat like a life preserver. Setting up a schedule for yourself is a tool to help you function and make good decisions for your family. It gives you POWER! It takes you from feeling victimized by that boat-load of tasks, and actually gives you freedom. I like that! And, in keeping with my theme song this week, it's also about respecting your role as a wife, a mom, a keeper of all things important, and overseer of your growing organization. When I think about setting up my schedule, I like to borrow a phrase from a famous pirate movie, "They're not really rules, they're more like 'guidelines.'" Guidelines give you some structure to work within, but there is a lot of wiggle room for when the unexpected happens, and we all know it will happen. 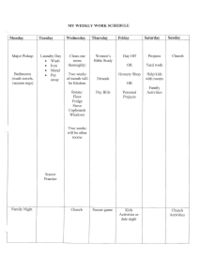 Katherine, at Raising Five, has an excellent post about a Weekly Schedule. Since we are both Bonnie McCullough devotees, and because Katherine has really nice color-coded examples (jealous), I will give a slightly different slant. Paraphrasing from Bonnie, here are some tips on setting up your schedule. 4. Set aside time for fun-specific time for relaxation. You owe it to yourself! 6. Delegate responsibility. You don't have to do it all! Every member of the family should carry part of the load. Be democratic, share the fun ones, too. 7. Plan ahead by scheduling. If your schedule shows soccer after school, dinner could be ready to pop in the oven before you leave. If you have a special event on a cleaning day, move your cleaning day over, or start it the night before. If an activity doesn't fit on paper, simply say no to it. 8. If an activity doeasn't fit on paper, simply say no to it. Oh, I just said that! But it deserves it's own special point. So quit cramming stuff in that doesn't fit. 9. Value your time. Pretend you are being paid a professional wage during your work times. Respect the work you do and what it does for your family! 10. Stay flexible. You are not a prisoner to the schedule. Its purpose is to allow you to take control of managing what happens in your home! 11. Be creative! It was a revelation to me to realize that I didn't have to do ALL my cleaning and laundry and yardwork and oversee kids' chores and do kids' sports all on Saturday! I began making Mondays my major work day, freeing up Saturdays to do other things. Now, just a few thoughts: When you feel like your work is never done, it drains you of energy. Assigning days to do specific tasks frees you of the burden of the other undone things. See? You don't have to worry about doing that monstrous pile of laundry on any other day than Laundry Day. Sweet freedom! I suggest starting very simply. Don't fill in every minute with tasks you know you'll never do. Think in terms of chunks of time, and just put in what you know MUST be done and live with it for awhile before you get real complicated. Like Bonnie McCullough says, you deserve to treat yourself well, and with dignity. Caring for your household is a way of caring for yourself, and expressing gratitude for what you have. It's about creating a home sanctuary for the people you care about most: your family. Here is a sample schedule for someone who does not work outside the home. How about I talk about setting up a schedule for a mom who works outside the home next time? 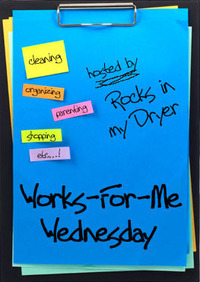 For more great Works For Me Wednesday tips, visit Shannon at Rocks in My Dryer! Works for Me Wednesday, hosted by Shannon. Yeah, that's right, toenail fungus. Don't be surprised when you take off that pretty red summer nail polish if your toenails look a little ratty. Here's a natural remedy that really helped mine, and since we're all among friends you can leave me a comment telling me about just how bad YOUR toenails look. I'm here to help. Use 1 part Tea Tree Oil to 1 part Lavender Oil and mix into a small bottle with a dropper. You can get these natural products at a health food store. Place a drop on each toenail morning and night, and let it soak in. Don't let it get onto your skin if you can help it. Tea Tree oil is a very potent antibiotic and lavender will help fight the infection and prevent skin irritation. I started seeing improvement after about a week, and I kept doing it along with my vitamin regimen, which is pretty much whenever I remember it. I also go all fall and winter sans polish, so that they get a chance to get healthy. With my feet stuffed into socks and shoes, no one can see the damage. Try this before you get the expensive prescription stuff and hopefully it will work for you, too! For other tips, try this link. What does Minimum Maintenance really look like? One of the challenges of training kids to be able to clean is helping them "see" what needs to be done. How many times have they announced that their room is clean, and you find that it still looks like a bomb went off in there? They often don't see their own mess. The same thing is true for us moms. We need to train our own eyes to see the mess sometimes. Well, in my case, our messes are only too obvious. But we get used to seeing newspapers and toys and unfolded clothes laying around and don't even realize how it affects our subconscious need for order. We wonder why we just can't feel good about our home life. So here's an easy list of the Minimum Maintenance activities to help you "see" what should be done. Entry: pick up, no backpacks, shoes, stuff to take upstairs. You don't want to trip on stuff as you come in the door. Bedrooms: Everyone responsible for keeping their own room neat: beds made, clothes picked up off of floor, trash thrown away. Obviously 2 year olds can't make their own bed, but if you spend a few minutes with your small child, helping them "see" what should be done, and then doing most of it yourself, it will gradually transition as they become more responsible. Mail Center: (ahem, if you have one) junk mail thrown, bills and important papers where they go, etc. You always want to start with the big items (bed, table top, countertops) and work down to smaller areas. And work with gusto! Why take hours to do what can be done in minutes? Leave yourself time to do fun stuff so you aren't a slave to your house. Try an "apronon" with pockets to put little items in as you go. I found that I don't do ALL the rooms, and all the rooms don't take 5 minutes EVERY DAY. That's where being flexible is important. When my kids were little, it was nearly impossible to go from room to room without interruption. Maybe that's why I liked picking up at night. I always kept some kind of basket in each room (living room, kitchen, bedroom, etc) that I could chuck toys into for the easiest possible clean up. It wasn't the most organized way to handle toys, but it helped keep the floor from looking like a minefield, and made it easy for little helpers to do a quick pick-up, too.